Scratch, a free drag-and-drop programming language, is the perfect place to start out if you are new to coding. But, just because it is accessible for beginners, doesn’t mean that you can only create simple programmes. In this blog post, Interim Head of Content and Curriculum and Code Club leader Rik Cross explains how to start creating sophisticated games with Scratch. In response, I often show them examples of more sophisticated things that have been made with Scratch, such as open-world games and 3D graphics. Scratch is a rich, full-featured programming environment, and moving past the basics into Scratch mastery can really help to develop and embed programming skills and knowledge. In this blog post I’ll share some tips for stretching more advanced learners in Scratch. When learners talk about wanting to make ‘proper’ games, it’s usually because they are trying to replicate a feature seen in a game they play themselves. This provides a great source of motivation, and learners are often surprised to find that these features can easily be developed in Scratch. Take the example of creating a game in which movement is ‘forwards’ into the stage, rather than from left to right. In this 3D ‘sprint’ game, forward movement is created by alternately pressing the left and right arrow keys. This causes the finish line (and other scenery such as trees and spectators) to move down the stage and increase slightly in size, giving the illusion of movement in a 3D world. Learners are often keen to include background music in their games. It’s very easy to add this by repeatedly playing a sound until it is finished. It’s also possible to add a volume control: display a variable as a slider, and use its value to set the volume. Here’s a simple Scratch project that demonstrates this: Music with volume. Multiple screens can be achieved in Scratch through the use of backdrops and button sprites — there is an example of this in the Code Club Brain Game project. Each separate ‘screen’ is created by broadcasting messages and then showing or hiding the elements required for each screen. You can even add special effects to change how buttons look when they are clicked or when the mouse cursor hovers over them. Through the use of multiple backdrops and ‘touching colour’ blocks, it’s relatively easy to Create your own world in the form of an open-world game that spans many rooms. Backdrops contain coloured ‘doors’ that transport the player to the next (or previous) backdrop as well as setting the player’s position. In-game sprites can also be programmed to only appear in a particular room. Once learners are familiar with programming concepts and can use them in isolation, the next step is to be able to combine and apply those concepts to solve a problem. You could compare this to working towards fluency when learning a spoken language, and sticking with Scratch — rather than moving onto another language — makes this journey much easier. One way to facilitate this is to support learners in developing algorithms. An example of such an algorithm is a high score feature. To begin with, this could be a simple ‘high score’ variable that is checked against a score each time a game is played, but it could be as involved as creating and updating a table for storing the ten highest scores. Other examples of algorithms that could be developed are a scrolling background and a line-following sprite. A lot of the skill in programming comes from finishing a project -— combining ideas, adding in little extras, and removing bugs. This is often the time when real Scratch mastery happens: dealing with unexpected side-effects and smoothing the edges of a project. Where possible, I always ask a learner to share their project when they’ve finished it, as this provides motivation for producing a high-quality finished product. This sharing can be with other club members, or more widely through the Scratch website. Having a real audience gives learners a reason to thoroughly test their project, and they can use feedback to drive improvements. This sharing, feedback, and improvement cycle can also uncover things that the creator may not have thought of, such as communicating instructions for controlling a project. Have you created an awesome Scratch project in your Code Club that you want to share with the world? Coolest Projects is a showcase where young people can exhibit the cool ideas they have been working on throughout the year. This year, for the first time, Coolest Projects will be coming to the UK, with an event held at Here East in London on Saturday 28 April. If you’d like to showcase a project, register your idea to apply for a place at by 25 March. Find out more at at coolestprojects.org/uk. Running a Code Club is an excellent way to compliment the introduction of the new Computing curriculum, as it offers children lots of opportunities to learn and build upon skills taught in Computing lessons. Computational thinking is a skill that takes time and practice to hone. Code Club provides an ideal space for children to apply their Computing knowledge, and improve their confidence as they undertake a range of novel projects. Although we offer a suggested route through our curriculum, children have a huge amount of flexibility in deciding which projects to undertake, and in which direction to take them. Children have the opportunity to spend an extended amount of time on a project, in a supportive environment. Working on an extended project also gives children the time to fully test their project, fix bugs and solve problems, elicit feedback from others and use this feedback to improve their creations. These are important parts of a project that can sometimes be cut short in a 1-hour Computing lesson. 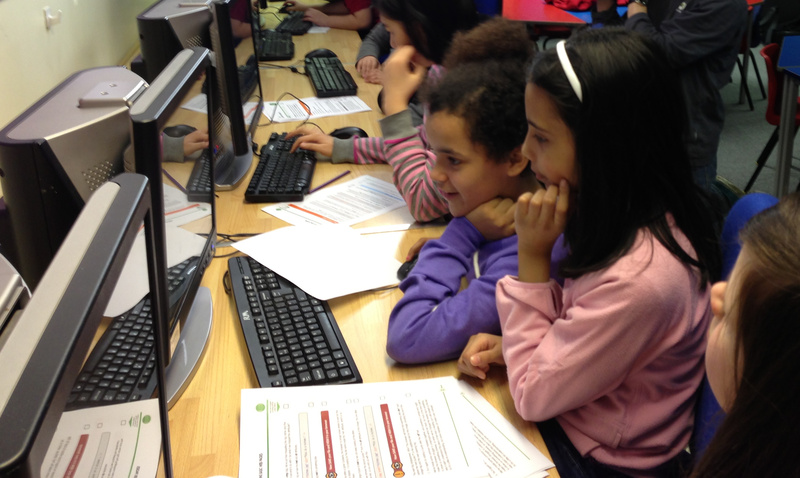 As the new Computing curriculum equips children with computational thinking skills, Code Club provides a place for children with an interest in programming to share ideas and collaborate with likeminded people, and to broaden and extend their programming knowledge. The Computing curriculum’s stated aim is to equip pupils with the skills “to understand and change the world”. But why stop there, when the rest of the universe is in danger? In the Doctor and the Dalek game, the Doctor and his Dalek companion must work together to find the ‘Orb of Fates’ before the Sontarans, Cybermen and Daleks get to it! The game was created by the BBC (along with Somethin’ Else) as part of their ‘Make it Digital’ campaign. 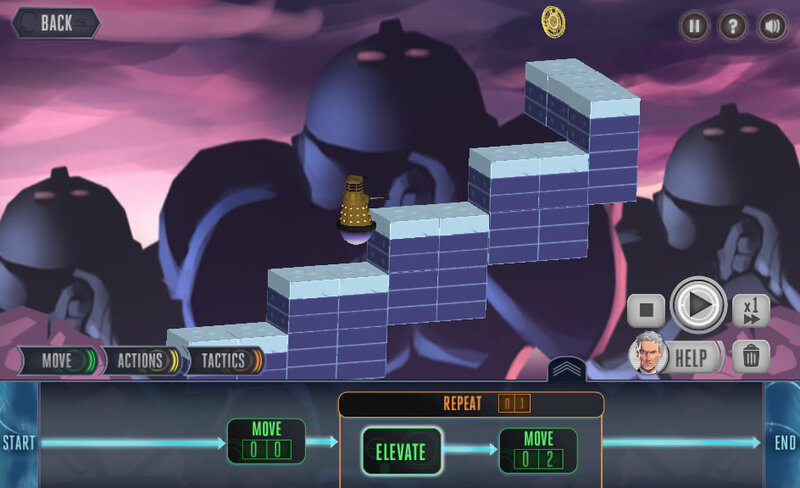 The game includes a number of ‘challenges’, in which the Doctor programs the Dalek using sequences of instructions, selection, repetition and variables. For example, the ‘repeat’ command can be used to climb stairs efficiently, and the ‘if’ command can be used to decide when to stun enemies. Code Club worked with the BBC on these in-game challenges, to ensure that they provided a real opportunity to learn and apply key programming skills. The BBC were great to work with, and it was clear at every stage of the game’s development that their key focus was to teach programming. The programming elements feel like an integral part of the game, and not just an add-on. To illustrate this, they have also created a teacher pack which explains each of the programming constructs, along with examples and projects for further study. All of this means that the game is a great place for children to start programming, before moving on to graphical-based programming languages like Scratch.